On average there are 11,000 people daily becoming seniors. Not all of them are lucky enough to have someone living with them. That is where SensorsCall comes in. It is designed to monitor the habits of the person to keep track of daily activity. This product is a small box that simply plugs into any outlet. It follows the activity habits of the person and can detect any unusual behavior. In the event of a potential problem, it sends an alert to a designated caregiver or responsible person that there may be a situation of concern. 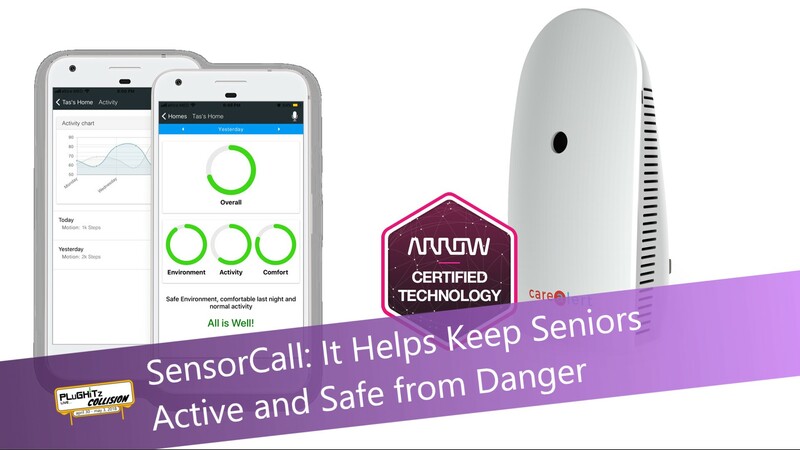 It takes about a week for it to calibrate and learn the daily habits of the senior. One of the many ways this is beneficial is for medication regulation. You can record a gentle reminder in a friendly voice for when it's time rather than have a blaring alarm go off and startle them. Another feature, which is designed for asthmatics, monitors the current humidity level and will alert you when there is a condition that might affect their breathing. Finally, another great capability is for daily or weekly reminders for errands such as doctor appointments or hair appointments. Since the number 1 health hazard for seniors is loneliness and lack of socialization, this is a very smart addition to the household. These devices, when grouped, can measure their activity and therefore show if they are getting enough socialization. The cost of these is approximately $120-$130 each. The service runs about $20 per month. The number of units will vary with the size of the home they are in. A large home, which is 3 or more bedrooms, will require at least 5 units. A smaller home will require at least 3 units. The release date is approximately 90-120 days. For more information go to sensorscall.com.